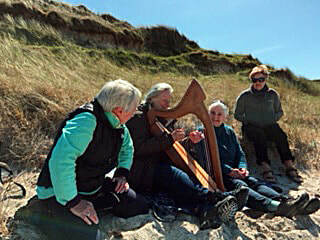 Spiritual Harp Retreats give you time to 'just be' by the waves, as the wind plays the harp strings, and the seabirds call. Together, we will experience the inspiration that comes from joining with others, in the process of deep spiritual enquiry, inspired by the music of the Celtic harp - and the joy of sharing precious moments held in the light, peace and music of a holy Celtic island. ​Four days to leave behind the demands of daily life, and be held in a place of spiritual friendship, gentle harp music, peace and meditation...and laughter! ​from the album 'Iona Essence'.